This is always one of my favorite games of the season. The pageantry and respect shown is amazing. No dog in the fight personally so I just hope for no injuries. And it will be very emotional this year with the recent passing of President Bush 41. Best uniform matchup every year hands down....But not even in the same universe as the OSU-TTUN rivalry cmon. I personally love this game and I watch every year though but I don't think we're doing anyone any favors or being respectful of these instituions by pretending this game is even a millionth of a percent of the scale of The Game. I don't think we're doing anyone any favors or being respectful of these instituions by pretending this game is even a millionth of a percent of the scale of The Game. Really? I guess we'll have to agree to disagree on this point. I mean yeah it's nice to say and it's patriotic sure. I totally get that. I enjoy the game a lot. But you seriously think sticking the Army/Navy game on normal rivalry Saturday would get even 40% of The Game? Do you think there are die hard Army/Navy fans that didn't go to West Point or the Academy/and or didn't serve? I'm all for the pomp and circumstance and for everything the game stands but i think that's getting lost here because the minute you say the rivalry of the Army/Navy football game is anything less than the greatest thing on Earth, some people's brains equate that with saying you don't support the troops which couldn't be further from the truth in this case. I would love to see anyone that says this matchup is up there with The Game bet the rent that this game would produce ratings, coverage airtime, and revenue anywhere even close to the Iron Bowl, The Game, Red River Shootout etc if it was played on rivalry week. The Game has enjoyed some national prominence, and for us fans, it's a date worth mentioning when you accept the head coaching job. But to maybe provide some perspective, we don't have any ownership in Yale v Harvard (the other Game), but it means a lot to them. Same for any SEC "rivalry." Just about any fan of college football that served (even former enlisted squids like myself), appreciate the match because both teams always bring their A game. Granted, the 16th-century triple option offenses can be tedious, but because they are so evenly matched, the game is usually not boring. For another bit of perspective, compare the occupational hazards of the stars of The Game after they graduate to those of academy graduates. All valid! If I served I would feel the same I'm sure. I just don't understand what pretending that "One could argue this is as big of a rivalry" as OP says is doing to respect these guys. The data is there. The Game 2018 was the highest rated college football game. Ever. Not in Ohio, not in the midwest, the highest national audience for a college football game ever. The social media data is there. The revenue data is there. The Army/Navy game is nowhere even close to any of the other big rivalries in college football by any metric. I just don't get why we have to say things we don't mean about this game as some faux respect thing. If you went up to a group of vets and asked "Would you rather I volunteer my time or money to one of the numerous charitable programs that benefit veterans and their families...or I can pretend a football game between Army/Navy is as important and as nationally relevant as The Game/Red River Shootout/Iron Bowl/USC - ND rivalry" what do you think they would pick? I guess I am just not meant for this time in history where saying things you don't mean online for the equally meaningless approval of like minded strangers is somehow considered noble. I will retreat to my fortress of reality and stop poking the bear. We good. I should think of it like my high school bowling trophy: it means nothing to anyone but me. I even edited out the 'respect' in my comment. You're right in that it's basically a game between two mid-majors that doesn't impact college football one lick. Bowl selections are already made. So, enjoy the only game on Saturday, or not. But since one of those mid-majors is my mid-major, Go Navy!! Beat Army!! 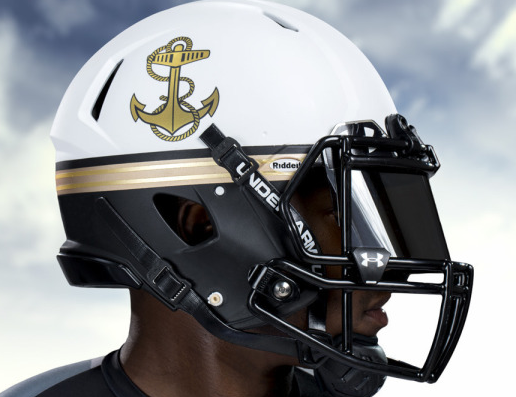 Navy has had a lousy year this year, but this is one of those games where records don't count. Just like THE Game. I do like the Army uniforms. I was a Black Lion in basic training. Was that in honor of the 28th Infantry Regiment? Where was your basic training? Never been there. Thanks for your service. Nice post Major. I am giving you a virtual salute since I didn't get past an E6 in the reserves. I sincerely return that salute, NPF. I was an E7 when I was commissioned, so I know where the backbone of the Army is - the NCOs. Recency bias is the only thing that makes us forget how important this rivalry is. Navy has dominated the series recently other than the last two years, but this one's had a lot more back and forth over the years. Also, those with a dog in the fight represent a smaller and smaller share of our population as an era of relative peace coupled with the WWII and Korea era vets leaving us changes the percentage of our population that are veterans or have direct ties to one. We collectively display respect for the military quite a bit these days, but for a large and growing number of us, it is from a distance. As for me, I first learned of the importance of this game from what will seem like a strange source, but I am likely not alone. It was from re-runs of a TV show that first aired months before I was born. Points for the first to get it. As for me, I first learned of the importance of this game from what will seem like a strange source, but I am likely not alone. It was from re-runs of a TV show that first aired months before I was born. Not knowing when you were born makes it a bit tough to guess TV shows. The only thing that comes to mind is the "Combat!" series with Vic Morrow. That, and "McHale's Navy," but that was a comedy. I was going to guess Dragnet (for no reason at all). (My personal favorite though, which I watched in syndication during my childhood: The Black Sheep Squadron). Gee, how could I have overlooked M.A.S.H.? I don't recall them mentioning it on Hogan's Heroes, and while I watched Black Sheep religiously as a kid (reruns, I'm pretty sure), I don't recall them mentioning it either. BTW - those Army uniforms are fire. Go Army, Beat Navy! I hope to get to one of these games some day.